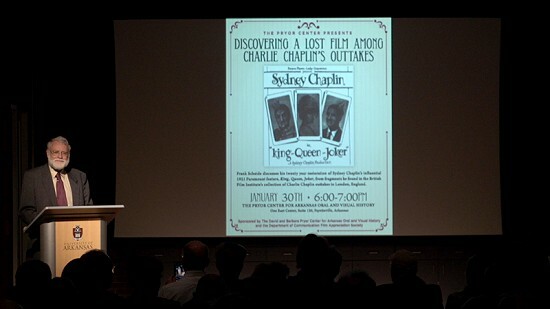 On January 30, 2019, Frank Scheide presented "Discovering a Lost Film among Charlie Chaplin's Outtakes,” as part of the Pryor Center Presents lecture series. In 1999 the British Film Institute in London invited Frank Scheide to catalog a collection of 423 cans of 35mm film outtakes which had been featured in Kevin Brownlow and David Gill's documentary series about Charlie Chaplin entitled Unknown Chaplin. On the first day of cataloging, Scheide discovered outtakes from a lost and forgotten feature film entitled King, Queen, Joker, which had been produced by Charlie Chaplin's brother, Sydney, to fulfill his 1919 million-dollar contract with Paramount. Based upon the outtakes and a surviving synopsis, Scheide determined that Sydney Chaplin's King, Queen, Joker was a prototype for Charlie Chaplin’s 1940 anti-Hitler film classic The Great Dictator— a connection scholars had not previously made. In this presentation, Scheide discusses why the Chaplin outtakes are important to scholars, shares his research on King, Queen, Joker and describes how he reconstructed this historically significant, lost Sydney Chaplin feature from its outtakes. Frank Scheide is a professor in the Department of Communication at the University of Arkansas, Fayetteville, where he teaches film history and criticism. He is one of the world's foremost authorities on Charlie Chaplin and Buster Keaton. Scheide's doctoral dissertation focused upon the early life and music hall career of Charlie Chaplin. His discussion of the outtakes from Chaplin’s 1916 Mutual film The Count is a special feature in the 2005 DVD release of Kevin Brownlow and David Gill’s 1983 groundbreaking documentary series, Unknown Chaplin, which won an Emmy and a Peabody in 1987 after being broadcast as part of the PBS series American Masters. Scheide has also produced several documentaries on the Cherokees. In 2017 Scheide was the recipient of the prestigious endowed faculty award, the OMNI Center for Peace, Justice and Ecology Faculty Award, which was created to "promote the study and teaching of peace and nonviolence in accordance with the insights of Mahatma Gandhi, Martin Luther King Jr., and Senator J. William Fulbright."